NYC is home to the most fascinating luxury apartment buildings, especially its pre-war apartment buildings – glamorous residential buildings that were built before World War II (between 1990-1939). One of the primary reasons why architects and builders were motivated to design and build these apartment buildings was the population boom in NYC during the late 1880s through 1910. The goal was to accommodate the swelling population with sturdy brick and stone buildings that were built for great form, function, and endurance. Built in 1884 and designed by Henry J. Hardenbergh, The Dakota is one of the oldest and perhaps the most famous cooperative apartment buildings in New York City. For years, The Dakota has been the preferred home of many celebrities because of its prime Central Park location, impressive history, and grandiose residences. Part 19th century French chateau, part Gothic castle, The Dakota is a perfect fusion of luxury real estate and NYC history. The building has 9 floors and 93 residential units, ranging from 3 to 10 rooms, replete with dormer windows, arches, and balconies that offer an expansive view of the Central Park. Although this building has undergone extensive renovations since it was first built in 1884, it has kept much of its original character intact. Some of The Dakota’s prominent residents include John Lennon, Yoko Ono, Lauren Bacall, Leonard Bernstein, Joe Namath, and Rosie O’Donnell. Built in 1930, this elegant building designed by Rosario Candela was dubbed by the New York Observer as, “The most pedigreed building on the snobbiest street in the country’s most real estate-obsessed city”. This also happens to be the most expensive co-op in the city, surpassing the 18th-floor apartment at the Sherry-Netherland that previously held the record. In 2005, Rupert Murdoch paid $44 million to purchase the triplex penthouse formerly owned by Laurance Rockefeller, the largest amount paid in New York City history for a cooperative apartment at the time. The average sale for a home in this 16-floor co-op apartment building which has 24 residential units is $30.5 million, and the building requires all cash purchases, no mortgages. Some of its famous residents are Laurance Rockefeller, Rupert Murdoch, Elizabeth Arden, Charles R. Schwab, and Robert Johnson. This masterpiece by acclaimed architect, Emery Roth was built in 1930, and is considered as one of the most prestigious addresses and stunning buildings in all of Manhattan, with the Beaux-Arts exterior of its 27-storey twin limestone towers. The San Remo is the first twin-towered apartment building to rise in New York. Its 136 residential apartments are majestic in scale, with impressive entrance galleries, lofty ceiling heights, and marvelous prewar details. Some residences have duplex layouts and terraces. Residents enjoy the finest luxury amenities and white-glove service, including a 24-hour doorman, two majestic lobbies, private and semi-private elevator landings, state-of-the-art health club, community room, laundry, and storage room. A few of its prominent residents include Demi Moore, Bruce Willis, Bono, Tiger Woods, Dustin Hoffman, Steve Martin, Stephen Sondheim, Steven Spielberg, and Donna Karan. Built between 1906 and 1908, The Apthorp is called, “Monumental and magnificent” primarily because it is one of very few buildings in NYC to take up an entire city block. 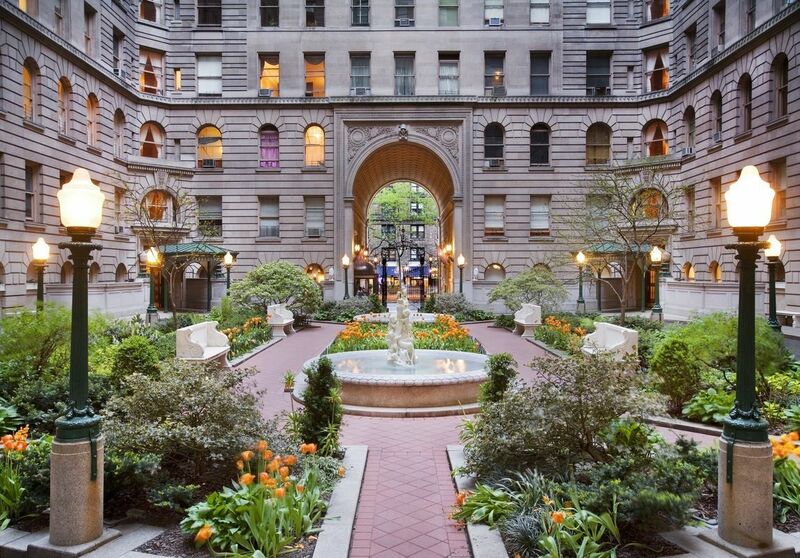 Built around a large interior courtyard in true Italian Renaissance form, this iconic building exemplifies the grandeur of New York’s Gilded Age. For over a century, The Apthorp has been an eminent yet serene enclave in the heart of New York’s Upper West Side. This 12-floor apartment building designed by Clinton & Russell was designated as New York City landmark in 1969, and was added to the National Register of Historic Places in 1978. It has 154 residential units, and some of its popular residents include Cyndi Lauper, Nora Ephron, George Balanchine, Al Pacino, and Conan O’Brien. The Ansonia was designed by noted architect Paul Duboy, and initially opened its doors in 1904 as a luxury hotel. During the 1970s, it was converted into a residential apartment building, with most of its 385 apartments retaining their original architectural details, such as glass and mirrored doors with transoms, intricate herringbone hardwood floors, and delicate paneling, despite having been modernized with new kitchens, renovated bathrooms, and sizeable closets. 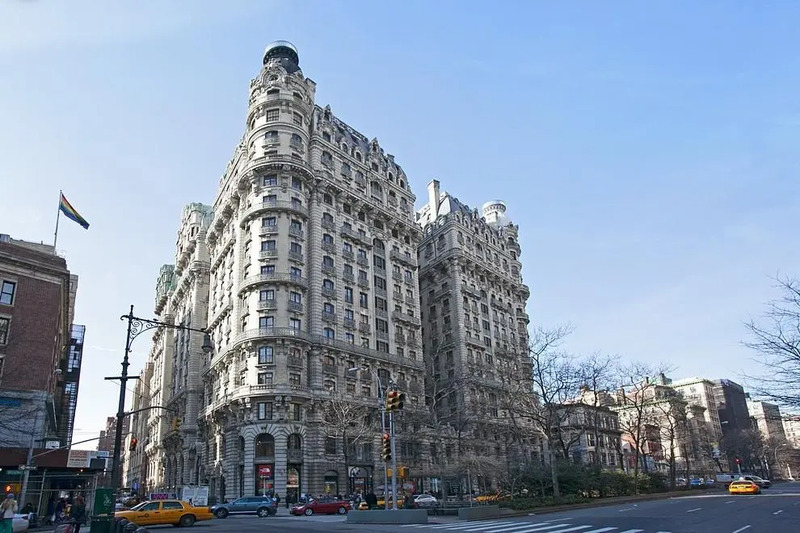 The Ansonia has been a favorite choice among celebrities because of its wonderful location and beautifully restored luxurious amenities, including the carriage entrance with its block-long lobby, roof garden, 12-foot wide corridors, exquisite staircases, and classy elevators. Moreover, a new lounge, front desk, and concierge have been added in the main lobby. A few of its famous residents include Macaulay Culkin, Theodore Dreiser, Igor Stravinsky, Natalie Portman, Babe Ruth, and Angelina Jolie. Despite the old-world charm of the majestic prewar apartment buildings in New York City, some people prefer more modern design and architecture, which the city also has been seeing a lot of. In fact, NYC’s skyline has been constantly changing because of these newer constructions that are designed to complement the urban lifestyle. VIΛ is a 32-storey building occupying almost a full city block at the corner of West 57th Street and West Side Highway. Designed by the Bjarke Ingels Group (BIG), the tetrahedral New York apartment building is a hybrid between the European perimeter block and a traditional Manhattan high-rise, offering the compactness and efficiency of a courtyard building plus the airiness and the expansive views of a skyscraper. The building has 709 apartment units and has only recently started welcoming residents in 2016. 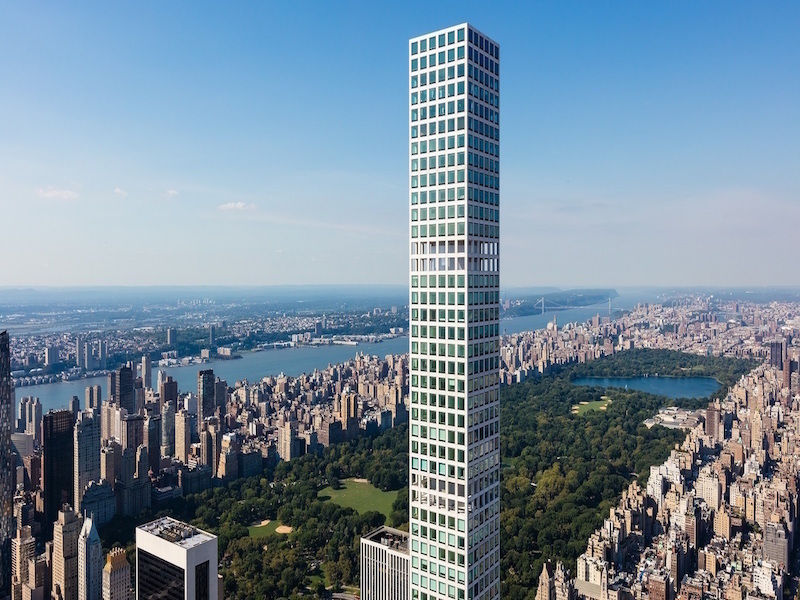 The pencil-thin 432 Park Avenue designed by Rafael Viñoly and was completed in 2015 is undeniably iconic. Located in the opulent Midtown neighborhood, this skyscraper is located right in the heart of Manhattan overlooking Central Park. With 96 floors and 125 residential units, 432 Park Avenue is the tallest residential building in the world and the second-tallest structure in NYC. Its narrow design is intended to maximize the building’s height relative to the site. The oversized windows will give residents a magnificent view of the city, while allowing ample amounts of natural light to illuminate their space. Designed by ShoP Architects, 325 Kent Avenue is part of the 11-acre redevelopment of the Domino Sugar Refinery Complex by Two Trees Management Company. This 16-storey apartment building has 520 residential units, ranging from studios to 2-bedroom units with private terraces and balconies. This building is hard to miss – it features an impressive copper and zinc facade with an interesting unique rectangular shape that’s hollow in the middle, similar to that of a donut. The building offers a plethora of amazing amenities including a 7,000-square foot roof deck with barbeque grills, cabanas, and outdoor dining areas. Originally known as Beekman Tower, New York by Gehry is the first and only residential project designed by Frank Gehry. 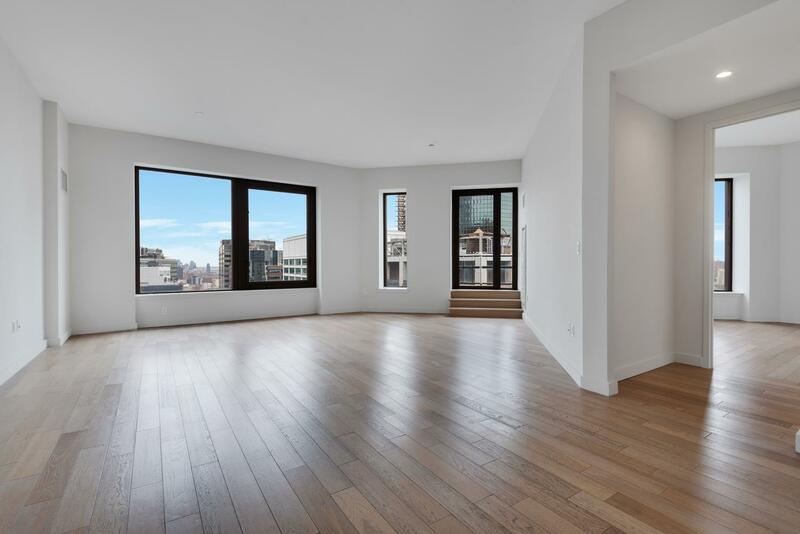 At 76 storeys, this NYC apartment building offers an exceptional range of 904 residential units with views of New York City’s downtown and midtown skylines, rivers, bridges, and landmarks. It is considered to be one of the most beautiful towers in Downtown Manhattan since the Woolworth Building. Residents have exclusive access to a wide selection of exceptional health, wellness, social, and entertainment amenities, including landscaped plazas, a private driveway to the lobby through the porte cochere, a private dining room and a large adjacent drawing room with multiple seating areas with a grand piano, an indoor swimming pool, grilling terrace, screening room, children’s playroom, tweens’ den, library, fitness center, and a spa treatment suite. One of the flashiest new residential projects on the NYC horizon, the American Copper Buildings designed by SHoP Architects have became popular for their 3-storey skybridge, the highest one in the city at 300 feet above street level. 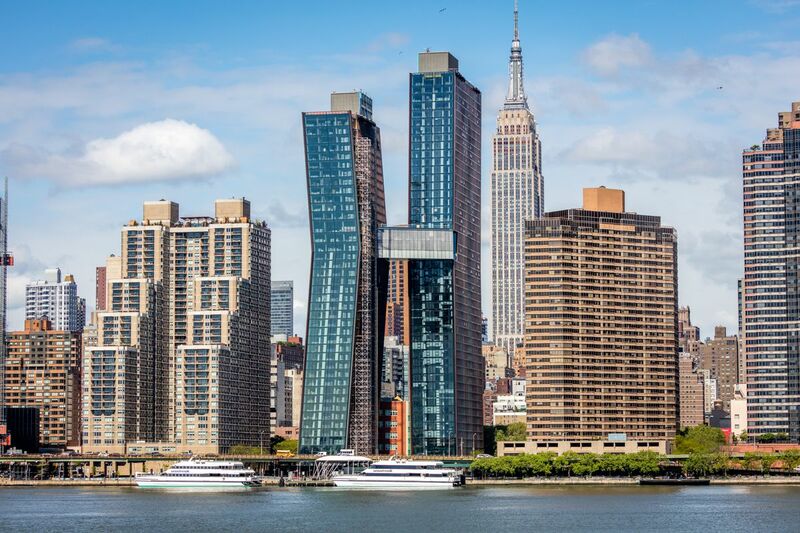 The “dancing towers” along the East River houses 761 residential units with each tower offering over 300 unique layouts with magnificent views of the Empire State Building, East River, and the Manhattan skyline. NYC is filled with the most impressive apartment buildings, both old and new. While you find a deep sense of history and nostalgia in its numerous pre-war buildings which have been kept beautifully intact all these years, you will gain a fresh and unique perspective from the newer, iconic architecture around the city.